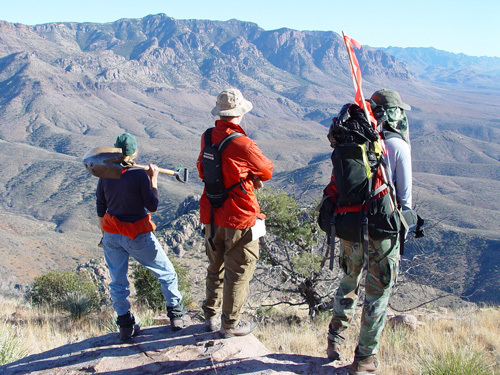 Kandres Halbrook, Dan Potts, and Travis Bean on top of Sombrero Butte, Pinal Country, Arizona. Travis Bean graduated from the University of Arizona with a B.S. in Plant Sciences in 2000 and then earned a M.S. in Range Management under Steve Smith in 2002. He is currently in the Renewable Natural Resource Studies Ph.D. program in the School of Natural Resources. Travis' initial interests in range management and revegetation led to his present work with invasive species. Invasive species are arguably the greatest threat to semiarid ecosystems and Travis is leading investigations into the ecology of plant invasions. He is also heading the effort to eradicate buffelgrass (Pennisetum ciliare) from the 350-hectare Desert Laboratory on Tumamoc Hill in Tucson and control the species' spread in the greater Tucson Basin. 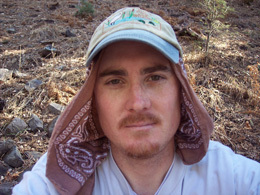 Travis is specifically interested in how seed dispersal and seed banks affect the distribution of species across fragmented landscapes, how climate affects the emergence and persistence of species in harsh environments, how climate and surrounding landscape condition affect recovery rates and successional trends in severely disturbed habitats, and in developing climate-based phenological models of invasives facilitate their management.